I'm so glad you're here to join the party! We have 3 fantastic sets debuting this month! The Girl Friday Ink Squad will bring you inspiration from a new set each day this week. and will be available on April 18th! You will have so much fun with this first set! 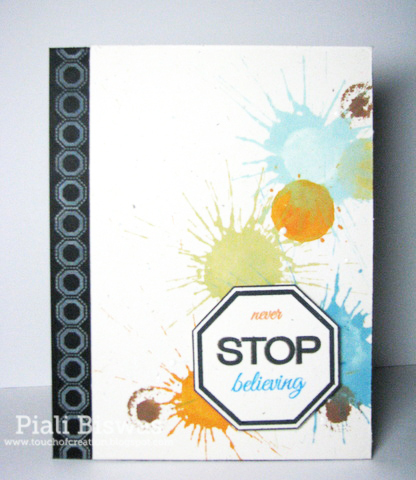 It has fun background strips, and lots of interchangeable encouraging sentiments. in mulitple colors. Those sequins are scrumptious! How cool is this chalkboard card?! Girl Friday Lynn has created a card 2 ways. 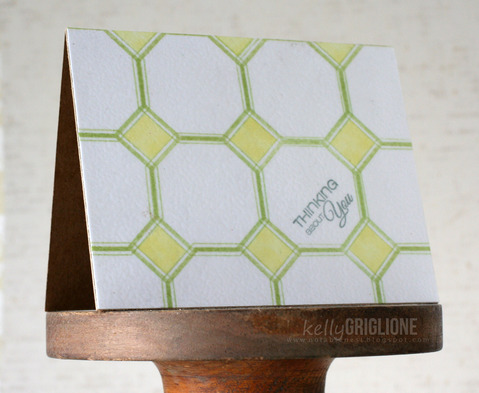 The border strips stamped partially onto the edges are gorgeous! She added sentiments from Calm and Gentle which fit beautifully. I think the pattern strip on the side of this first one is really pretty! On this second one, she kept it simpler by adding just a simple color strip on the side. Both are beautiful and it's fun to see such a simple element change can alter the look! Girl Friday Karen created a one layer beauty! and the jute twine adds a touch of cozy warmth. This one from Girl Friday Piali is fabulous! I love the fun splatters in the background, and how the colors repeat in her sign! The border strip looks great as little pattern pop on the side. 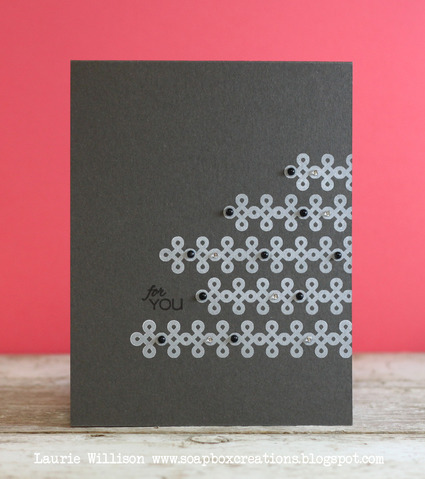 Girl Friday Laurie has created a card that you need to remember! then add a sentiment...any sentiment! Girl Friday Kelly created a linoleum floor pattern! square that was created. Really makes a fun background pattern! 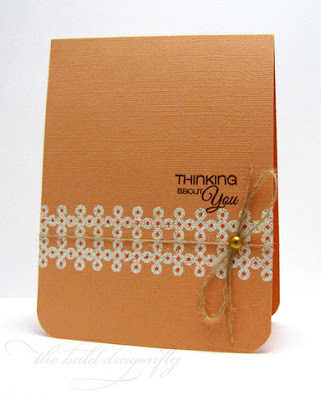 Look how she stamped the background strip on this one...it looks like tire tread! and created a fun baseball! Lastly, she created a dream catcher! and I think this card is dreamy to the max! Girl Friday Dana got creative with her use of border strips. I really like the bit of whimsy that her delicious bow brings to this otherwise very graphic card. I love how she stamped her own background using 2 of the border strips. This is one of my most favorite stamping techniques because you can create your own custom look! What a fun way to start this week! Would a prize make it even more fun? Are you a cardmaker, a scrapbooker, or both? We'll be back tomorrow with another exciting set to show you. Once again you have some great sneak peaks - can't wait for release day! These cards are great! I'm a cardmaker and a scrapbooker. Love this set, so cute. I want it! I am both a cardmaker and scrapbooker. These stamps are awesome! I look forward to seeing the rest of the new stamps! Love the borders and the sentiments.. all your sets are always so versatile. I have never made a layout.. just cards on occasions, but scrapbooking is something that I am really looking forward to. Both...started with scrapbooking, discovered stamping and card making a few years later. Card maker all the way! I love the quick results from making a simple card. Awesome peeks today everyone! I am a card maker. I scrapbook and make cards. For me, they go hand in hand. This is a great stamp set. I'm looking forward to the rest. Thanks for the giveaway. Wow fabulous cards by the Girls Friday! So many great inspirations. I 80 percent card maker and 20 percent scrapbooker. I am strictly a card maker. I have to say, Lynn's card drew me over to check out all the samples. Looks like a fun set! Incredible cards by the Ink Squad! I started out as a scrapbooker but then one day I made a card, and I've been making cards ever since! Thanks for the chance to win! LOOOVE this set. I'm a card-maker. Thanks for the chance to win! Such creative ideas with this cute set - LOVE. I am both a card maker and scrapbooker but I do cards more often - less time spent to get my creative fix! I am mostly a cardmaker, with a little bit of scrapbooking thrown in. I am mostly a card maker. I also like to make mini albums and 3D projects. I'm a card maker...love making cards!!! I scrapbook occasionally! Love the stamp set...I see so many cool cards in my future! Thanks for the chance to win! Started with scrapping, moved onto cards. I'm really intrigued with these new stamps your releasing. While I started with scrapbooking, I found I loved making hand made cards. Can't wait to see what each set is! I'm a cardmaker. I keep meaning to do a scrapbook of my son's baby pictures, but haven't gotten around to it. Bit overwhelming (22 years of photos by now). Cards are fun little projects that I can tackle in a day. Love the diversity of all these ideas. GREAT sentiments on the set! What a fun set! Loving the sentiments and the versatility of the octagon! I do both cards and layouts. Fabulous inspiration from the designers today! I am a cardmaker. I tried scrapbooking but it's just not for me. I have not become more of a card maker but I started off as a scrapbooker and still like to record memories that way. I love this set of stamps! I'm now very familiar with the STOP sign in the US - but I can see this working for lots of cards. Do you know whether this coordinates with the Spellbinder Octagon dies? I am most certainly a card maker. Scrapbooking is on my "someday" list though. Loving this stamp set. Oh my gosh! These are so much fun! After looking at each DT card, I thought...wow, that's my favorite. Then I would move on to the next and have the exact same thought! I'm a cardmaker at heart! Fabulous cards and very versatile stamps. I am mainly a cardmaker but I dabble in scrapbooking. 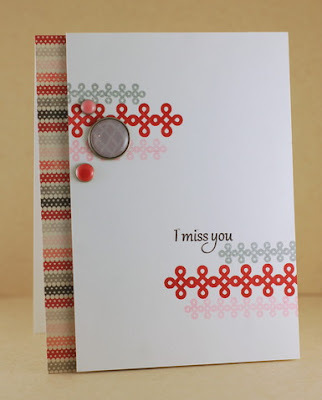 Lovin the sneek peek today...I'm a scrapbooker who spends most of her creative time making cards! mostly cards, and the occasional mini album - but I also do a lot creative work daily in my personal diary/journal using stamps. LOVE these! Amazing cards, can"t wait to see the full reveal! I am a cardmaker all the way! This set looks AWESOME, and I LOVE the DT's samples---SO CLEVER!!! I'm strictly a cardmaker these days, and I LOVE IT!!! wow! 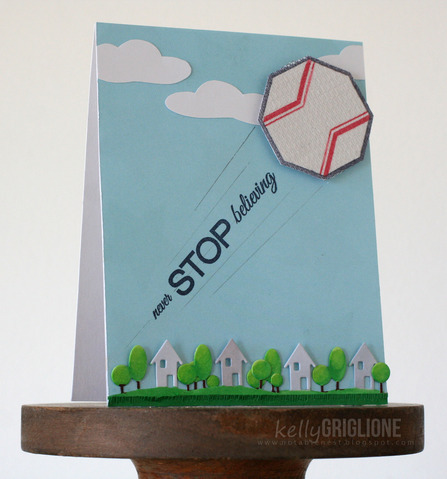 Loving all of the creative ways that stop sign was used! oh and i am both! love cards and scrapbooking! I started out making cards but now I definitely make cards and scrap pretty much equally. Thanks for the chance! Love this set!!!! I am mostly a card maker....but someday I'll get back into scrapbooking! Fantastic cards! I am a cardmaker considering what I need to be a scrapbooker! These cards are gorgeous. I can't wait to see the sets!!!! Great cards ! I am a cardmaker - love brightening someone's day with a special card ! Fabulous cards!! Love the stamps and the sentiments! I'm more of a card maker than a scrapper but I do a bunch of layouts for room signs for teams from our town that go to an international creative problem solving competition! Gives them a great title page for their scrapbooks from the event. Looks like a great set! I'm a cardmaker! This is set looks funny! I am a card maker! I love all the sample cards, the new set is so versatile. I'm a cardmaker, but when I go on trips I do some scrapbooking. Thanks for the chance! This set is just brilliant, I adore the stop sign. All of the samples are fabulous too! Great inspiration! I am a cardmaker, but does a few layouts each year. I made about one dozen scrapbook pages several years ago. But, I am definitely a cardmaker and never tire of making them!! So many new products and techniques - one could never get bored!!! Love the cards from the design team and the new stamps look great! SO much fun! The sayings are wonderful! I started as a scrap booker (years ago) but am now a card maker. I'd like to get back into scrapbooking but time and lack of space to spread out keeps me making cards! What fun cards! The dream catcher card is amazing!!! I am a card maker!!!! I am a card maker. The only time I scrapbook is when I've been on vacation and I want to keep the photos handy. I love your stamp sets. I'll be on the lookout for them. You get so many different designs with one set. I started out as a scrapbooker but then when I went back to school, all crafting was put on hold. Now, I rarely scrapbook and just make cards as the crafting time is very limited. So looking forward to seeing the complete sets tomorrow!!! I'm mostly a card maker but trying to get started with scrapbooking. cards and other crafts but i wish i had an occasion to try scrapbooking!